Hadrurus arizonensis pallidus is a color morph of Hadrurus arizonensis. You can see from the pics, it is pale to the point of almost appearing colorless. These are the largest scorpions found in the United States and the largest scorpion in the family Vaejovidae. 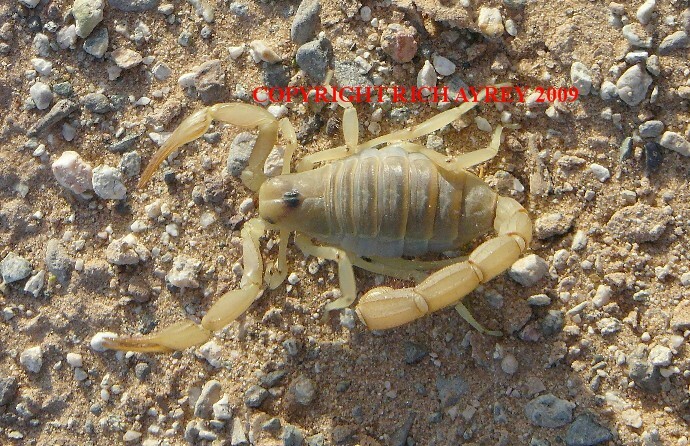 This Arizona Scorpion photo was taken near Parker, Arizona. Both the common color form and the pallidus form are easy to care for since they feed on almost any small invertebrates. This species is impressive due to it's size. My friend James tells me this scorpion has a painful sting, however the effects wear off after a few hours. This photograph and all pics by Rich Ayrey, do not reproduce without the written permission of the photographer. This site copyright Rich Ayrey 2009-2017. This Arizona Scorpion identification page created 03/31/09.